When it comes to soccer,* Australians are a blindly optimistic lot. We came into the World Cup with by far the lowest ranking of the 32 countries and then got handed the crappiest draw of any team. That’s the New York Times saying that, by the way, not just this Aussie diehard. And yet we all had a feeling, didn’t we? That maybe, just maybe, we could pull a surprise. And so we toddled down to our tellies this morning with a spring in our pyjama-swathed step. I can admit I permitted myself an excited squeak or two as I summoned SBS to the screen. 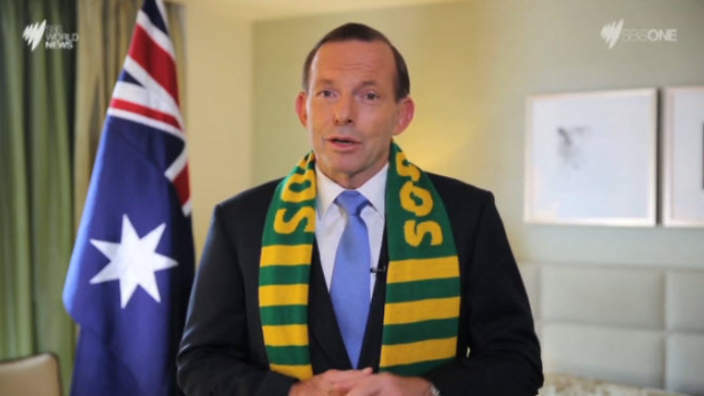 Prime Minister Tony Abbott got in on the act with a televised message of support, wearing a green and gold scarf that was clearly straight out of the packet. There wasn’t a pie crumb or a tomato sauce smear on it. “Ange, Mike and the Socceroos,” he said, eager to put his ‘Canadia’ gaffe behind him. All good, except the Aussie captain’s name is Mile. As in how high Tim Cahill jumps for a header (though pronounced MEE-lay, as in filet mignon). But at least the PM didn’t say anything about appointing a female coach. Or stuff up the team’s name, when there were three other vowel choices that could’ve ended badly. After duelling national anthems, play was underway. For an Aussie World Cup spectator, there is always that moment when faith meets reality and hopes are wrenched back to earth. Let’s call it the 12th minute. We were just getting over that Sanchez sucker punch when minute 14 happened. Which was a total kick in the guts. We weren’t even a quarter of the way through the game and already we were two goals down. We had two choices — we could regroup or we could be Spain. Looking back, we needed a warm-up like they do in tennis, so we could get the hang of defending against the Chilean attack. Because once we got that down pat, from about the 20th minute till the 93rd, we were in complete control of the game. In the 35th minute, the national treasure that is Tim Cahill opened our account with a header that has become his stock in trade and I split my daughter’s eardrum in celebration. We were still 2-1 down but now it was the Chileans on the back foot. Cahill equalised in the second half but was ruled offside. We kept threatening to shake the Chilean net, while at the other end a lunging Alex Wilkinson stopped the ball breaking our own goal line by millimetres. By this time, Craig Foster had given up any pretence of objectivity and had become instead a mad Socceroos fan who’d lucked a seat in the commentary box. This annoys some people but, being a little one-eyed in the commentary department myself, it’s one of the things I find endearing about him. As the clock wound down, it seemed only fair we should come away with a point. We couldn’t buy ourselves a foul short of chopping off our own legs but were pulled up every time the Chileans tripped over their own socks. And then, at the death, we let one final goal in. We had lost 3-1. But from the comments on social media, which spoke of pride (the good sort) and fighting spirit (the only kind we know), you’d have thought we were winners. And we are. Look at the Group B standings. 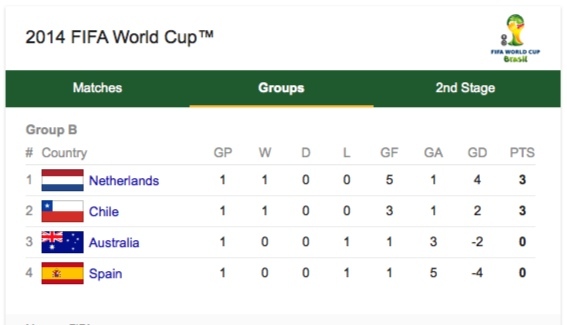 No one said we’d be ahead of Spain after the first game. * While ‘football’ may be the correct term for the game, it has never slipped easily from my tongue. And besides, our team is not called the Footballroos. You’re welcome. Of course, I wish you every success against Chile and not so much against the Socceroos! Um Kaz, knowing how much you appreciate, the finer things in life, hot fit blokes etc, what about the hockey!!!??? We are world champs stuffing Holland hope you can work that into the next blog when we play them at football er sorry socccer! You’re absolutely right, Dave. Fantastic effort by the boys, plus the girls were runners-up and move up to 2nd in the world rankings. Leave it with me.